The fifth-generation CR-V, completely redesigned and reengineered, will reach dealer showrooms in December. Yesterday afternoon, Honda unveiled an all-new fifth-generation version of its best-selling compact crossover. The 2017 CR-V, which will reach dealers showrooms around mid-December, is a ground-up redesign of the brand's most popular SUV and the best selling crossover in the compact segment. Outside, not a single panel of the more aerodynamic body is carried over from the 2016 model. A longer hood and wheelbase (up from 103.7 inches to 104.7 inches) and shorter rear overhang give it a more purposeful appearance, while a new standard Automatic Shutter Grille System lowers drag and narrower A-pillars improve driver visibility. 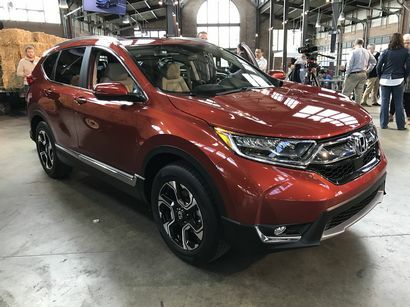 Overall length has been increased from 179.4 inches to 180.6 inches, while the new CR-V is also wider by 1.4 inches (from 71.6 inches to 73.0 inches). Taking a page from Ford's playbook is an optional hands-free tailgate that can be opened and closed via a foot-activated sensor under the rear bumper. Standard alloy wheels come in either 17 or 18 inches depending on trim, while new headlights with a new wing-shaped LED daytime running light array are standard on all models. 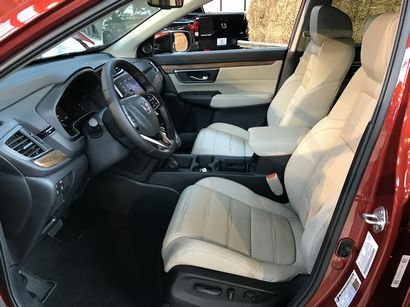 Inside, the 2017 CR-V makes the most of its larger exterior dimensions. Passenger volume, on sunroof-equipped models, has been increased from 101.5 cubic feet to 102.9 cubic feet. 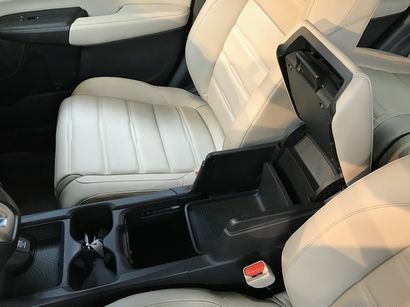 On the non-sunroof LX (which Honda projects will only account for 25 percent of sales), that figure rises from 104.1 cubic feet to 105.9 cubic feet. 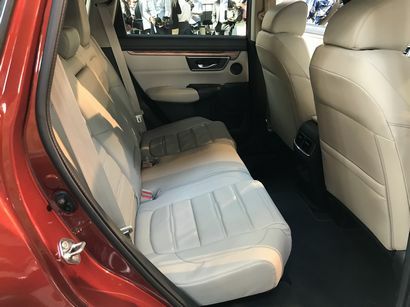 But the big news, space-wise, is behind the rear seat, where cargo capacity has been increased from an already-generous 35.2 cubic feet to 39.2 cubic feet. Honda has also engineered an ingenious platform system back there. 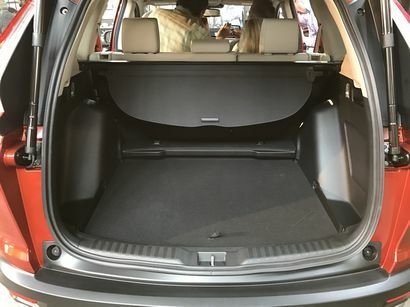 With the storage floor in its lowest position, you get the maximum amount of cargo space. 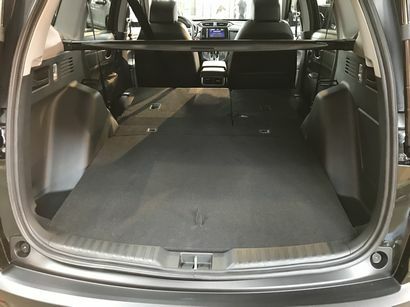 Pick the floor up and place it on the second, raised, level and, with the rear seats folded forward, you have a flat loading floor that makes loading large objects in and out a breeze. For 2017, the four 2016 trim designations carry over: entry-level LX, mid-level EX, leather-trimmed EX-L and the top line Touring. 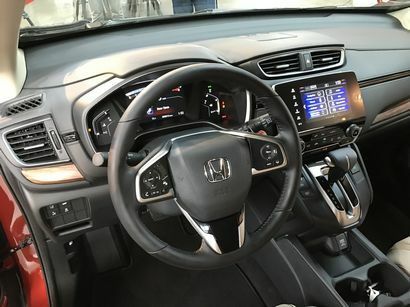 All four feature more upscale materials throughout the interior including a new soft-touch instrument panel as well as a new center color TFT display on the instrument panel in front of the driver. 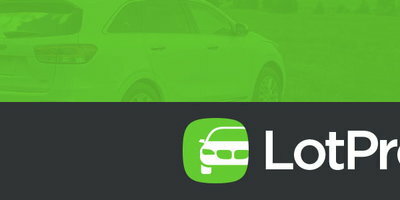 A 5-inch color LCD on the center stack is standard on the LX as is Bluetooth HandsFreeLink and streaming audio, Pandora compatibility a single, 1.0-Amp USB charging port in the center console. All other trims receive two console-mounted charging ports (a 1.5-Amp and a 1.0 Amp) as well as a 7-inch high-resolution touchscreen. 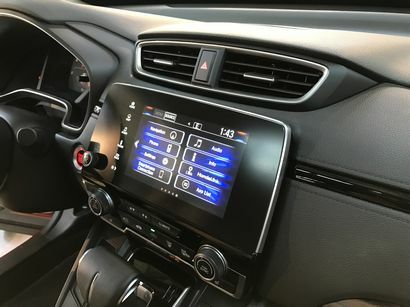 This system also comes with a physical, REAL (you read that right) volume knob - a feature Honda was quick to point out and a drawback to the previous system we've been ragging on for quite some time now. 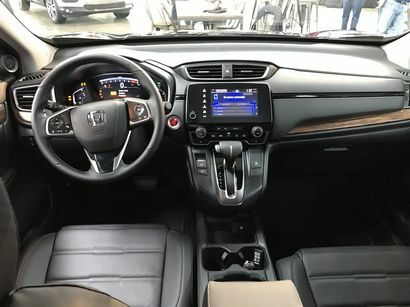 This also means that EX models and above will come with Honda's upscale Display Audio system that will also include HondaLink connectivity, Apple CarPlay/Android Auto, SiriusXM radio and SMS text messaging functionality. The biggest news for the 2017 CR-V, however, is what you'll find under the hood. 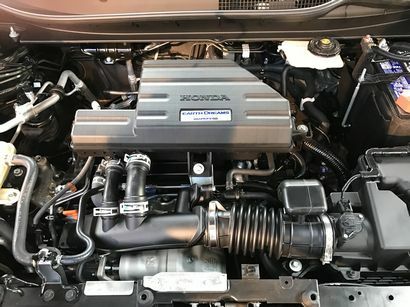 The LX trim features Honda's DOHC direct-injected 2.4-liter inline-4 delivering 184 horsepower at 6,400 rpm and maximum torque of 180 lb.-ft. at 3,900 rpm that carries over from last year's iteration. 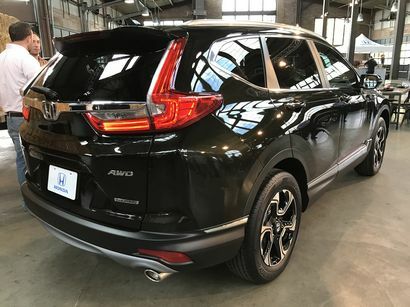 All other trim levels will come with Honda's 1.5-liter turbo four that, in the CR-V, generates 190 horsepower at 5,600 rpm and a maximum 179 lb.-ft. of torque between 2,000 rpm and 5,000 rpm. The only transmission offered with either engine will be a CVT with Honda's G-Shift control logic. And while EPA figures have yet to be released, Honda expects the turbo four to will receive "the highest EPA fuel economy ratings in the compact SUV class." Chassis specs include a MacPherson strut front suspension and multi-link setup in back – both utilizing low-friction dampers with tubular front and solid rear stabilizer bars. Ground clearance is up and the electric power steering is a dual-pinion, variable ratio system. All 2017 CRVs will come standard with stability and traction control, ABS, electronic brake distribution and brake assist, TPMS, LED daytime running lights and a multi-angle rear view camera (fixed guidelines on the LX, dynamic guidelines on all other trims). EX models and above also receive forward collision warning, lane departure warning, collision mitigation braking and road departure mitigation safety systems as standard equipment. In addition, these trims also feature lane keeping assist, adaptive cruise control with low-speed follow, auto high-beam headlights and blind spot information with cross traffic monitor. Honda has targeted the 2017 CR-V for an NCAP 5-star overall score from the NHTSA and a Top Safety Pick + from the IIHS including a Superior rating for frontal crash prevention when equipped with Honda Sensing. 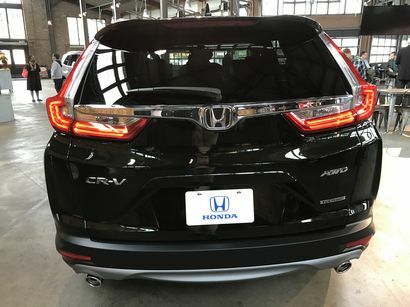 The 2017 Honda CR-V will be produced at three facilities here in North America. These include the current manufacturing facilities in East Liberty, Ohio and Alliston, Ontario, Canada. Honda will also be ramping up production at its Greensburg, Indiana plant that currently builds the Civic. A plant in Guadalajara, Mexico that currently builds the CR-V, will switch to assembling the subcompact HR-V.
Engine production will take place in East Liberty and Alliston, while the CVT will be built in Russells Point, Ohio. 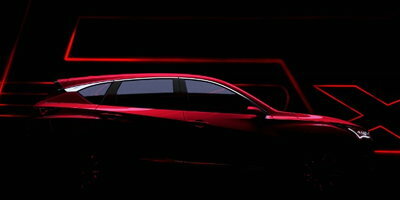 2017 CR-V prices will be released closer to the model's on-sale date which, according to sources at Honda, will be sometime around mid-December of this year.